A makeshift spacesuit snorkel, as held up by NASA's spacewalk officer Allison Bolinger at Johnson Space Center, Dec. 18, 2013. HOUSTON — Astronauts preparing to spacewalk outside the International Space Station are outfitting their spacesuits with an unusual device: a makeshift snorkel. The astronauts, whose task it is to repair a critical cooling system necessary for keeping the outpost fully powered, have an additional concern to the "normal" challenges of a quickly-planned extra-vehicular activity (EVA, or spacewalk). There is also a slight possibility their helmets could flood with water. After months of troubleshooting, it is now believed that the problem was a clogged filter, although the source of the contamination that caused the clog is still unknown. The astronauts replaced the filter unit on Parmitano's suit and in tests have been unable to recreate the flooding since. "We think that is an extremely clean suit and it is ready to go," flight director Dina Contella said during a briefing held Wednesday (Dec. 18). Still, spacewalkers Rick Mastracchio and Michael Hopkins will take added precautions just in case the leak reoccurs. "In addition to the training we have given to the crew on how to respond in the event they have water in the helmet again, we have updated two pieces of hardware that we're going to be installing in the suits," Allison Bolinger, lead spacewalk officer, said. About a month after he returned safely inside the station, Parmitano revealed that not only was the water inside his helmet impeding his vision and hearing, but his breathing as well. Mastracchio and Hopkins won't face that issue thanks to the addition of a 20-inch-long (50 centimeter) tube running from the front of their helmet down to their midriff. "This is your last resort," Bolinger explained, holding up a makeshift snorkel. "If water is encroaching your face, as similar to what happened with Luca in the last EVA, the crew member can lean down and use this to breath fresh oxygen from down near his midsection." Not that NASA had snorkels just floating around the space station. The astronauts had to "MacGyver" the apparatus that is more commonly associated with ocean divers than spacewalkers. "We had the crew fabricate these on orbit," Bolinger said. "They basically cut apart the plastic tubing on a water-line vent tube and then attached hook-line Velcro on one side and pile Velcro on the other." Normally, these tubes are used for piping water to provide cooling around the astronauts' bodies, but team members were inspired by the size of the plastic lines. "Some smart engineers on the ground were able to figure out, 'Hey! This is a similar diameter to a snorkel that you have for scuba diving,'" Bolinger recalled. "They were able to come up with this ingenious idea." The helmet absorption pad, or HAP, lines the back of the helmet to absorb any extra water that might develop inside, as displayed by NASA's spacewalk officer Allison Bolinger. 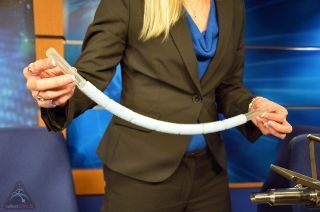 The snorkel addresses the need for the astronauts to be able to breath but is only meant as a worst-case solution. NASA team members wanted to give the spacewalkers a means to detect water in their helmets before it became a serious issue. Enter the helmet absorption pad, or HAP. "This is our first line of defense," Bolinger said. "If water was to enter the helmet... this [HAP] is designed to hold from anywhere between 600 and 800 milliliters of water." A modified absorbent pad designed to be installed on the back of the crewmember's helmet, the HAP will capture any water leaking into the helmet. By leaning back onto the pad, Masstracchio and Hopkins will be able to gauge how much, if any liquid, is leaking. "We've added steps for them to check the HAP to verify it is not 'squishy.' That's the technical term that we're using to define whether we think water has entered the helmet," Bolinger explained. "We have done quite a bit of testing on the ground with astronauts to verify if when you lean back when can you first sense 'squishiness' and that's roughly around the 200 milliliter mark," she said. "So if we have anywhere close to 200 milliliters of water that's definitely much more than we ever expect to be in the suit." As soon as the crewmember senses the "squishiness" in his HAP, that is a sign there is a problem in the suit and it is time to come inside, Bollinger said. The snorkel and pad are tools NASA does not expect the astronauts to need to use. They are for precaution only. Mastracchio and Hopkins will venture outside for the first of what is currently planned as three spacewalks Saturday morning (Dec. 21). The outings will then take place in two day intervals, with the third spacewalk, if needed, planned for Christmas Day. The spacewalkers will be working to replace a faulty pump module used to circulate ammonia coolant on the outside of the station with a spare unit mounted on the exterior of the complex. A similar trio of spacewalks was conducted by astronauts in August 2010. The repair is required after a flow control value inside the pump module malfunctioned Dec. 11, resulting in limiting the space station to just half of its cooling system. This in turn, necessitated powering down non-critical systems and experiments in two of the station's laboratories. Click through to collectSPACE.com to see more photos of NASA’s new spacesuit snorkel.